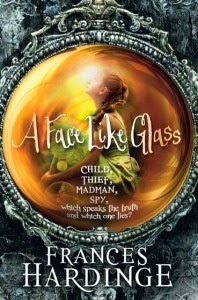 I love books which take you by surprise and A Face like Glass by Frances Hardinge is exactly that. The cover is beautiful and the mysterious blurb intrigued me. I wasn’t sure what to expect when I started but the story immediately grabbed me and didn’t let me go for an instant. Even when I wasn’t reading it, I was itching to get back into the complex, crazy world of Caverna. I whizzed through the pages and I was sorry when the book came to an end. You know when you want to read a book again for the first time? I had that feeling. Neverfell is found by Master Grandible in his cheese tunnels when she is five years old and he decides to keep her. However, something about Neverfell’s face shocks him so much that Neverfell’s face is kept covered for the next seven years when visitors come to the house and she never goes out. You see, people in Caverna don’t have Faces; they have to learn to show expressions like happiness, pity and anger. But Neverfell has Faces in abundance and this makes her dangerous. Neverfell’s face shows all her inner feelings and she’s not very good at lying. When Neverfell ventures out of the safety of Master Grandible’s tunnels for the first time, it is the beginning of a wild, action-packed adventure.Unbeknownst to Neverfell, she has enemies galore; enemies who would not hesitate for a second to kill her for reasons she’s trying to figure out. A Face like Glass is a real gem. I loved Neverfell. It was hard not to like her. She’s lived with the reclusive Master Grandible for seven years, has no memories of the first five years of her life and is in constant danger. She’s a heroine who grows through the book. Of course at the beginning she is slightly naive, but she learns quickly. She is kind, caring and above all, loyal to a fault. I loved all the other characters too. My favourite is undoubtedly the ever-paranoid Grand Steward; the leader of Caverna who has ruled for five hundred years. He does not trust anyone but himself, so much so that he has given up on proper sleep. He sleeps in shifts, for one half of the day, the right side of his body rests, and vice versa. He does all this so he can keep a permanent watch over his kingdom and scout out any would-be assassins. I wish we had seen more of him. The world Frances Hardinge has created is simply magical. There are so many crazy, outlandish things to take in but it all makes sense. Most of all, I adored Hardinge’s writing. It was fluid, vivid and glittering. I have loads of favourite lines. A criticism is that there were a few conversations that I thought should have taken place between certain characters towards the end of the story. Overall, A Face like Glass was a brilliant, magical wild ride. I loved the world Hardinge created and the characters I met. I can’t wait to read more from her. Amazing review, thank you Kulsuma! Hadn't heard of this before but I really like the sound of it, lovely review! Hope you decide to read it!